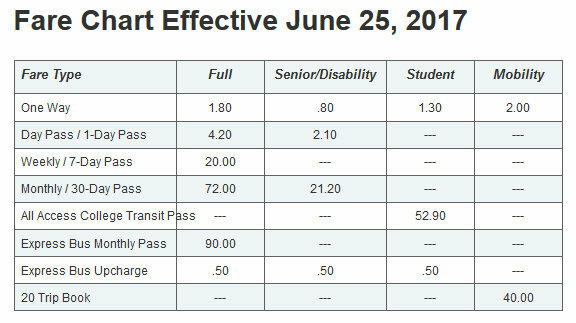 Officials promise better service, wary riders say, “we’ll see.” Details on bus changes and new fare structure. In a ceremony kicking off the region’s new bus system overhaul, Gov. Larry Hogan touted the $135 million BaltimoreLink — which starts at 3 a.m. Sunday — as a signature project of his administration. Hogan’s original announcement of BaltimoreLink – in the wake of his canceling of the Red Line light-rail project – drew scorn from Stephanie Rawlings-Blake (and eventually a civil rights complaint from the NAACP). Skipping the 2015 ceremony, the then-mayor issued a statement saying the proposed bus system makeover “fails to deliver the regional East-West economic development benefits” that residents and leaders in the region had sought. 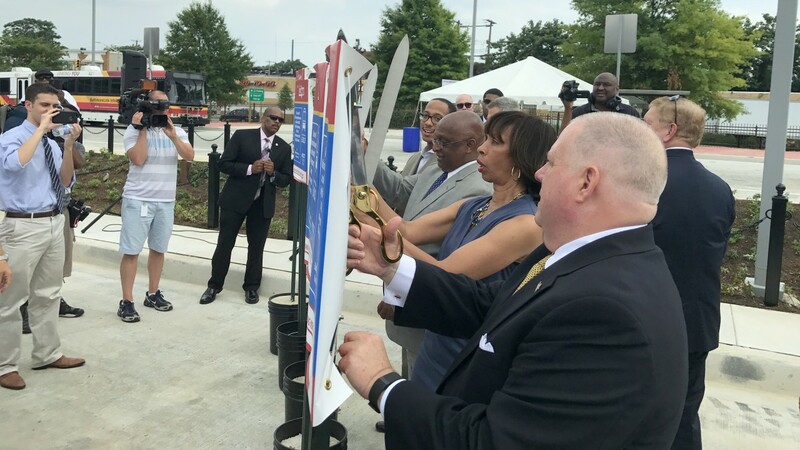 Speaking at yesterday’s ribbon-cutting, the current mayor, Catherine Pugh, called BaltimoreLink “an opportunity to link our citizens to opportunities” and lauded it as an example of city-state cooperation. City Council President Bernard C. “Jack” Young, meanwhile, acknowledged that the changes had drawn early citizen complaints, several of which were heard at the Council’s luncheon on Monday that featured Kevin B. Quinn Jr., acting administrator and CEO of the Maryland Transportation Administration (MTA). 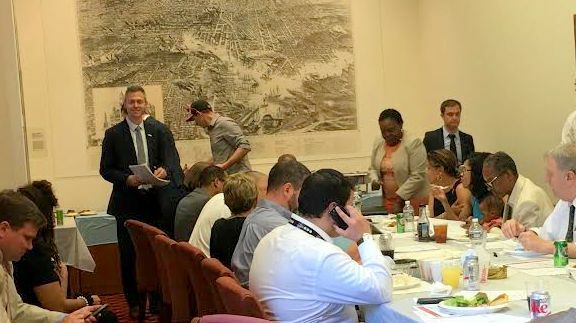 At the luncheon, Council members vented to Quinn about constituents’ concerns that included reroutings that eliminated needed service, new bus stops located in the wrong place, and changes that would make school commutes longer for city students. “I know it’s not perfect, but we’re working to address all the issues and concerns that citizens have been calling about,” Young said at the ribbon-cutting. 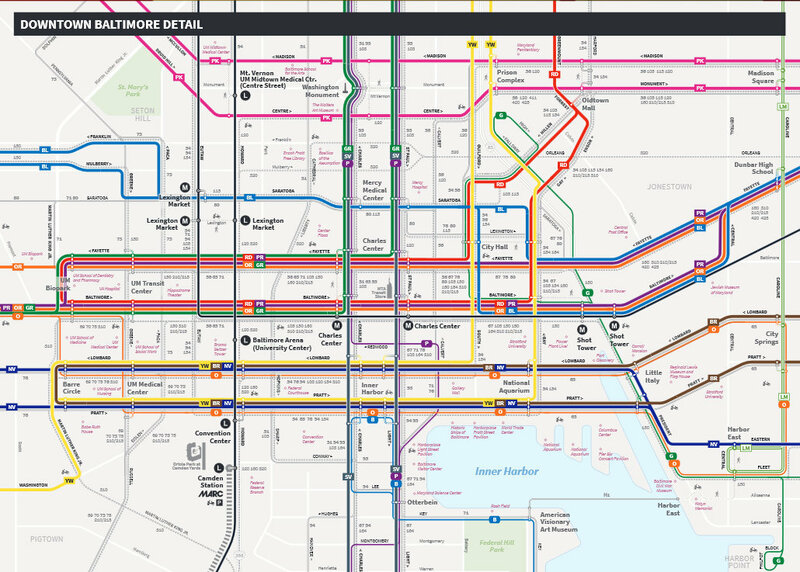 BaltimoreLink’s stated goals are to improve service and reliability in a number of ways: by maximizing access to high-frequency transit, strengthening connections between bus and rail routes and aligning better with new and “emerging” job centers. In practice that means rerouting many lines and eliminating service in areas it says have low ridership. Preparing for those potentially wrenching changes, the MTA undertook what Quinn said was an extensive public outreach program. Addressing Council members at the luncheon, he reviewed the agency’s efforts: 170 outreach events, 14 public hearings, over 4,000 public and operator comments, and changes to an early draft of the redesign based on public input. In recent months, MTA “ambassadors” have been out at high-volume stops explaining upcoming changes. An “InfoBus” has been providing free service and information to commuters. To ease the transition, the MTA is offering bus, light rail and subway service free for first two weeks of BaltimoreLink’s operation, he noted. This weekend, the advance work will conclude with a flourish, as MTA workers remove the blue vinyl covers on 5,000 bus stop signs to reveal the red-and-yellow signage of the new BaltimoreLink routes. For bus riders who have long complained about abysmal city bus service, the new system is being greeted with some skepticism. Standing near the West Baltimore ceremony yesterday was Marvin Williams, a 64-year-old from the Bentalou-Smallwood neighborhood who started using the buses this week after his car broke down. Finding the service spotty and hard to rely on made him doubt that officials will make the new system any better. 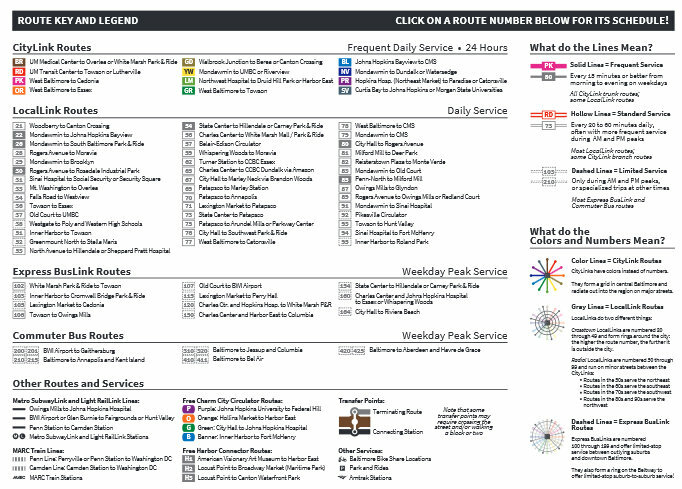 How is the revamped bus system structured? 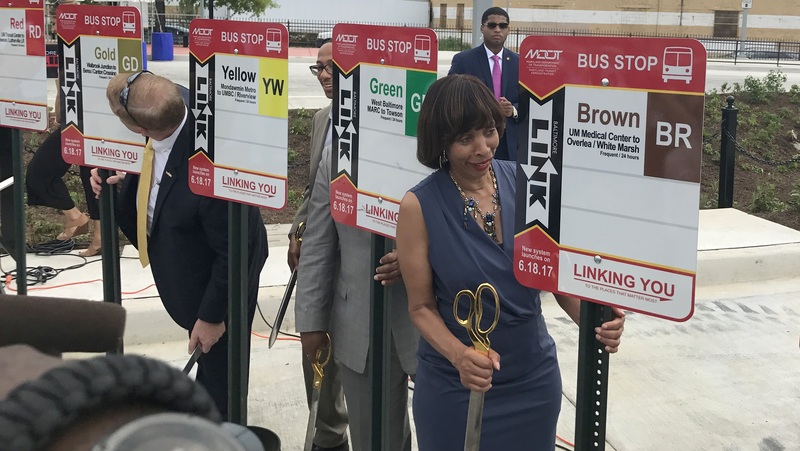 • CityLink: A dozen high-frequency color-coded bus lines providing 24-hour service that will form a downtown grid and radiate out of the city on major streets. • LocalLink: Less-frequent lines on neighborhood streets and branch-off CityLink lines. • Express BusLink: Limited-stop service connecting suburban areas to downtown. How do riders find out about route changes? A starting point is the MTA’s BaltimoreLink webpage. It includes interactive and static system maps. There’s also a Your Route page where riders can click on their current route and see its new name and how it may have changed. To ask questions by phone, call the Transit Information Contact Center (staffed weekdays, 6 a.m. – 7 p.m.) at 410-539-5000. Or toll-free at 1-866-RIDE-MTA (1-866-743-3682). Starting June 25, Light Rail and Metro Subway riders, as well as bus riders, will pay $1.80 for a one-way fare., up from $1.70. – Fern Shen also contributed to this story.